Strategically situated in the heart of Peshawar, Bacha Khan International Airport is located approximately 180 km from Islamabad (federal capital of Pakistan) which makes it about two hours drive from the capital via M-1 motorway. Since Peshawar is the capital of the Khyber Pakhtunkhwa province, it provides world connections for the majority of the northwest region of the country and adjoining areas of Afghanistan. Since the province has a large Afghan Pashtun community residing within KPK, Afghanistan flights have always been on the rise. The airport traces its origins to 1927 when there was a small airfield that catered to much of the British Empire and Imperial Airways aircraft that were either travelling onwards to the east (e.g. to China and Malaysia/Singapore) or west (e.g. Europe and America). For this reason the city was given the nickname "Gateway to the East" because it linked the traditional oriental culture to modern occidental traditions. The airport only gained much importance after the independence of Pakistan from the British Raj. The Civil Aviation Authority of Pakistan (CAA) and the Pakistan Air Force started to use the airfield jointly for both military and civil operations. There were countless flights operated to and from Pakistan's largest city, Karachi, as well as other cities within the newly formed state. The airport achieved international status in 1965 when the first flight was operated from Kabul, Afghanistan to Peshawar. The flight was operated by the national flag carrier, Pakistan International Airlines (PIA). As years went on the airport grew with more flights and aircraft and relative upgrade was carried out from time to time. It was not until 1981 that the CAA extended the terminal to meet future needs for the next decade and to meet the estimated growth of passengers. The apron was developed fully by 1986, where the airport was able to handle four wide body aircraft and two small narrow body aircraft at one time. In January 2008 the provincial government meet to discuss the expansion work needed to upgrade the quality of the aircraft in terms of facilities, terminal modernisation and cargo growth. In June 2008 the Deputy Director General of the CAA, Air Vice Marshal Sajid Habib, said that five billion rupees have been allocated to expand and develop Peshawar airport. Details of the work performed are ambiguous. Peshawar is a major passenger hub with 75% flights internationally bound. The airport is currently under evaluation to be upgraded to make it compatible with future needs of the geographical location. The CAA is currently working with the provincial government to develop the airport to meet international standards. The airport has some facilities to handle the basic needs of travellers, such as telephone booths (domestic/international), currency exchange, Automatic Teller Machines (ATMs), Internet stations (powered by Wateen), information counters, gifts and souvenir shop(s), snack shop(s), rental car services, as well as a post office. At present the following technical features are available at the airport. For passenger and cargo. Combination of flexible and rigid pavements. Nose-in parking for 4 wide-bodied aircraft at a time or 3 Airbus and 2 narrow body aircraft at a time. It has 4 air bridges which were constructed in 2018. Two Domestic Departure and Arrivals with a restaurant/Wireless internet facility in each. Two International Departure and Arrival Halls with /Wireless internet facility in each. One Executive Lounge for Premium and CIP passengers. Several FIDS/Plasma TV screens located at various points within the halls showing television programmes and flight schedule timings. Three Money/currency Changers Shops one each in Int'l departure lounge, Int'l Arrival lounge and Concourse Hall. On 1 May 1960 Lockheed U-2 spyplane, piloted by Gary Powers, left Peshawar Airport intending to fly over the Soviet Union. His plane was shot down and he was captured and put on trial in the USSR. This triggered the U-2 Crisis of 1960. On 26 March 1965, a PIA Douglas C-47A-1-DK took off from the airport. The aircraft lost contact with air traffic control mid flight. The aircraft had crash landed at the Lowery Pass. All passengers and crew did not survive the accident and the aircraft was written off. A PIA Fokker F-27 Friendship was making a night approach at the airport. Due to co-pilot error, the aircraft was lower than expected. The aircraft undershot the runway, causing it to land in a ditch which caused the aircraft to break up. Thirteen passengers and crew sustained serious injuries and the aircraft was written off. The incident occurred on 23 October 1986. Six international airlines had temporarily suspended flights to Peshawar in view of the deteriorating security situation in that part of Pakistan. This followed a rocket attack on the airport in August 2009. The absence of a functional five star hotel in the city after the Pearl Continental hotel bombing was also said to be one of the causes. The airlines were Saudi Arabian Airlines, Emirates Airlines, Gulf Air, Air Arabia, Qatar Airways and Etihad Airways. All the airlines resumed services to the city after a short hiatus, and RAK Airways even commenced new services as well. On 15 December 2012, the airport suffered a coordinated assault by a team of terrorists, which killed nine people. On 25 June 2014, A PIA flight originating from Riyadh was fired upon while it was flying at low altitude and landing at Peshawar, by unknown gunmen positioned outside the airport's vicinity. One woman was killed, while two passengers and a flight steward were reported injured who were rushed to hospital. The incident came just weeks after the deadly Jinnah Airport attack, sparking concerns over security of airports. Authorities launched a search operation after the incident, during which 200 were taken into custody. The UAE-based carriers Emirates and Etihad temporarily suspended their flight operations to Peshawar, but both carriers relaunched flights in August. On 23rd April 2019, an Airblue A320 Registered AP-EDA operating PA613 from Sharjah to Peshawar suffered a runway excursion on landing. The aircraft stopped beyond the end of the runway, but still on paved surface. No injuries have been reported. ^ "High level meeting discusses expansion of Peshawar airport in Pakistan". Archived from the original on 11 February 2009. ^ "Rs 5bn allocated to expand Peshawar airport". Daily Times (Pakistan). Archived from the original on 25 June 2008. ^ "Landing assault: PIA flight comes under fire over Peshawar airport". The Express Tribune. Retrieved 1 June 2015. ^ "Search operation: Over 200 arrested following attack on PIA aircraft". The Express Tribune. Retrieved 1 June 2015. ^ "PK-756 firing: Emirates, Etihad suspend flights to Peshawar". The Express Tribune. Retrieved 1 June 2015. 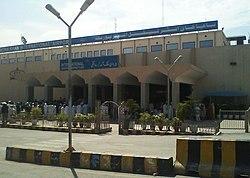 Wikimedia Commons has media related to Peshawar International Airport. Airport information for OPPS at World Aero Data. Data current as of October 2006.